David Korevaar chooses an interesting collection of pieces for his first all-Chopin disc. Only two are early works, the Op. 15 F-sharp major Nocturne (1830-32) and the First Ballade (1831). Only one other work dates to the 1830s, the Op. 27 D-flat major Nocturne (1835), the remainder coming from 1841 and later. Only three of the pieces are in a minor key and in Chopin that's generally an indication we'll hear the brighter side of the composer's muse. That's the case here, but more importantly, Korevaar plays Chopin like a seasoned master. The two Ballades are given splendid performances: Korevaar's tempos tend to be in the moderate to expansive range, and while he can sound a little finicky in places and may not always fully storm the heights in climactic sections, his grasp on Chopin's mixture of passion and elegance, with his creamy tone and wide-ranging, subtly employed dynamics, is as artistically sensitive and convincing as in almost any other performance you're likely to encounter in the concert hall or on record. The opening C minor Nocturne also gets a strong performance: the first half has a gentle and convincingly haunting ethereality and then Korevaar builds up tension midway through and subtly scales it down, reducing the mood to an unsettling disquiet at the close. 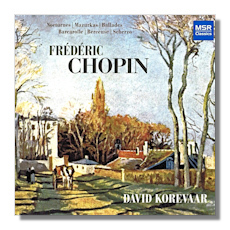 The dreamy, tranquil side of Chopin finds Korevaar in especially fine form: try the lovely aforementioned D-flat major Nocturne and notice how the pianist's rich velvety tone and tender phrasing seem to make the music float serenely in heavenly skies. Indeed, and the three Mazurkas are also played quite convincingly: the G major and A-flat major Mazurkas are given hearty, colorful treatments – appropriately so, but the darker C-sharp minor Mazurka, while elegant and stately throughout, has a lovely wistful quality, again thanks to the pianist's wide-ranging dynamics, as well as his unerring sense in grasping the emotional character of the music. The remainder of the performances, especially the Scherzo #4, are also quite fine, though the Barcarolle may be a bit on the tepid side, lovely though it is here. The sound reproduction is vivid and well balanced. The album notes by the pianist are informative, though I wish the print weren't so small. Korevaar has emerged in recent years as a major artist, at least in the recording studio. I have reviewed several of his previous releases here, including his disc of Hindemith sonatas (MSR MS1507), Schubert sonatas (MSR MS1557), and Hindemith Viola and Piano sonatas (MSR MS1593). I highly recommend this new Chopin disc.